WASHINGTON – Each week, another candidate throws a hat into the ring for the 2016 presidential campaign – a constant reminder that President Obama is at the end of his term. Currently, the president is engaged in a high-stakes battle, twisting the arms of the Democratic Party base and pressuring his close congressional allies, like the Congressional Black Caucus, to help salvage his attempt to hammer through a multination “trade” agreement with Pacific Ocean rim nations. That is simply very hard to understand. The neo-liberal Washington consensus, from the International Monetary Fund to the Organisation for Economic Cooperation and Development, has concluded that the pressing challenge today is rising inequality in income and wealth. And, as all students of inequality understand, the United States-as the industrialized nation with the most extreme inequality-is at a point where inequality is retarding future growth. One reason is that inequality lowers educational attainment of too many people, and the skill of a nation’s workforce is the key to economic growth. There appears to be additional reasons, including the capture of the political apparatus by corporate and conservative powers such as the Koch brothers and their nearly $1 billion campaign pledge, and the tilting of policies toward the haves at the top of the economic ladder to the detriment of national economic growth interests, like public investments needed for growth. History will reflect that President Obama did steer the United States free of one of the globe’s lingering problems-stagnant economies and high unemployment in many industrialized nations. He pushed for a fiscal stimulus during his first year in office, which helped the United States rebound more successfully from this Great Recession than other nations, especially the Europeans, who stuck more closely to fiscal conservative notions that trapped them in austerity. History also will note that a key element of America’s inequality-access to health care-as been greatly improved by the president’s Affordable Care Act. That act has helped reduce significantly the level of post-tax and transfer inequality the United States would otherwise have suffered. Yet, inequality has continued its destructive growth in the United States, despite our more robust recovery and the shrinking of the health insurance inequality gap. So, as President Obama is closing out his term, why would he spend so much political capital on a trade deal that replicates the worst elements of the post-North American Free Trade Agreement era, which have resulted in a dangerously growing U.S. trade deficit? Unfortunately, while the neo-liberal “smart Washington thinking” has had to rethink some of its policy prescriptions in light of the high costs of inequality, it still clings to its remaining plank of failed trade policy. The president is risking a lot. In addition to trade, he also risks the ignominy of being the only Democratic president to fail to increase the federal minimum wage since its creation; joining Ronald Reagan as the only other elected president to fail to do so. Currently, House Democrats, under Rep. Bobby Scott (Va.), and Senate Democrats, under Sen. Patty Murray (Wash.), have introduced legislation to incrementally raise the minimum wage to $12 by 2020. Their legislation would restore the wage structure of the post-World War II era when wages and productivity rose together, and incomes of those at the top and bottom rose in step. Clearly, avoiding the historical humiliation of being the one Democrat to stand in defense of one of the hallmarks of the New Deal, and a bulwark of the era of America’s shared prosperity that it launched, will take heavy political lifting against an entrenched Republican-controlled Congress rooted in undoing the New Deal and advancing policies that have only proven to exacerbate inequality. Today, median household incomes for Americans remain below their levels in 2007, which, thanks to two terms of the Bush economy, had fallen from their peak level in 2000. Also poverty levels for America’s families, which in 2000 were at historic lows, but climbed during the Bush administration, are even higher today. And consumption by the bottom fifth of Americans remains below their 2008 abilities. With this much pain continuing in the lower half of America’s households, it is hard to understand how the president is spending so much time on something so unrelated to the issues at hand. Finally, another component of inequality is the unresolved standing of millions of workers who lack the freedom of citizenship protections to bargain freely with their employers. The president campaigned on fixing America’s broken immigration system. And fixing it is important to raising the wages of millions of Americans by fixing the fracture this is causing in our labor markets. The Executive Orders he issued to take some measure of action on immigration will help. But, with so little left to his term, the president must weigh more carefully what his long-term legacy will be. We don’t have time for him to waste on investment deals benefiting corporations and the 1percent. William E. Spriggs is and AFL-CIO economist. 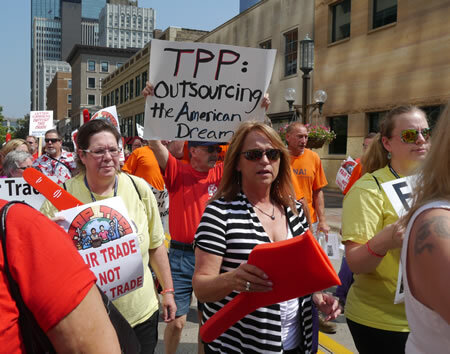 This article appeared on the AFL-CIO Now Blog.